Oregon Trail, one of the first simulation computer games, was first played in Don Rawitsch’s history class at Bryant Junior High School in Minneapolis, Minnesota on December 3, 1971. The history teacher created the game as an educational aid. Originally a board game, Rawitsch and colleagues Bill Heinemann and Paul Dillenberger realized it would make a good computer program. Dillenberger and Heinemann spent two weeks crammed into a former janitor’s closet at the junior high school programming a teletype machine, a screen-less, electromechanical typewriter connected via telephone to a mainframe computer that could issue prompts, receive commands, and run primitive programs. With no monitor, the original version of Oregon Trail was played by answering prompts that printed out on a roll of paper. At 10 characters per second, the teletype spat out, “How much do you want to spend on your oxen team?” or, “Do you want to eat (1) poorly (2) moderately or (3) well?” Students typed in the numerical responses, then the program chugged through a few basic formulas and spat out the next prompt along with a status update. In 1974 Rawitsch was working for the Minnesota Educational Computing Consortium (MECC) when he made the game, with many updates, available to classrooms across Minnesota. It quickly became one of the most popular programs. Eventually the game was made available on the Apple II, and later DOS and other platforms. Over 65 million copies of Oregon Trail have been sold since 1971, making it the most popular educational game of all time. In the original version hunting would prompt you to type in the word “BANG.” The speed of your typing would determine whether or not your hunt succeeded. 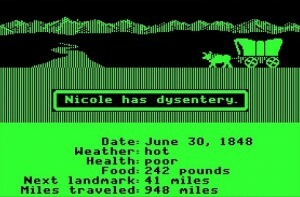 Thanks for the shout out on Oregon Trail’s 40th! Who knew back then that a program created in a hurry to help me teach history would become so popular. It has been very gratifying to hear from users over the years who enjoyed it so much.